First, let's open a big can of worms by asking, "What exactly IS the IoT?" 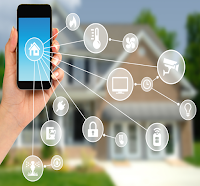 That question could be answered in any number of ways, but we'll start by saying that the term "Internet of Things" was coined by technology developer Kevin Ashton in 1999. To Ashton, the IoT meant a network of physical devices that collect data using embedded sensors and subsequently share that data with other devices on the network and with central servers (Figure 1). By that definition, autonomous vehicles also fit into the IoT ecosystem. Driverless cars gather and analyze an immense amount of data using a myriad of sensors including LIDAR, RADAR, and ultrasonic, and then transmit this data to the cloud. Eventually, technology will advance enough for a vehicle to drive itself under any conditions, with no steering wheel or human intervention. But the processing power to make this so-called "Level 5" autonomous vehicle happen in a cost-effective manner isn't quite here yet. In terms of hardware, the processing engine to make this possible today would fill the entire trunk of a vehicle. What about the IoT in our daily lives? How is it manifested? If you use a "smart" anything, you're likely connected to the IoT already. You have cameras installed to monitor your home, and you can see and/control them from your phone? That's the IoT. Smart thermostat, such as the Nest? IoT. Your fitness monitor? IoT. The possibilities are endless: take any ordinary item, add some sensors, give it an IP address, and call it "smart." 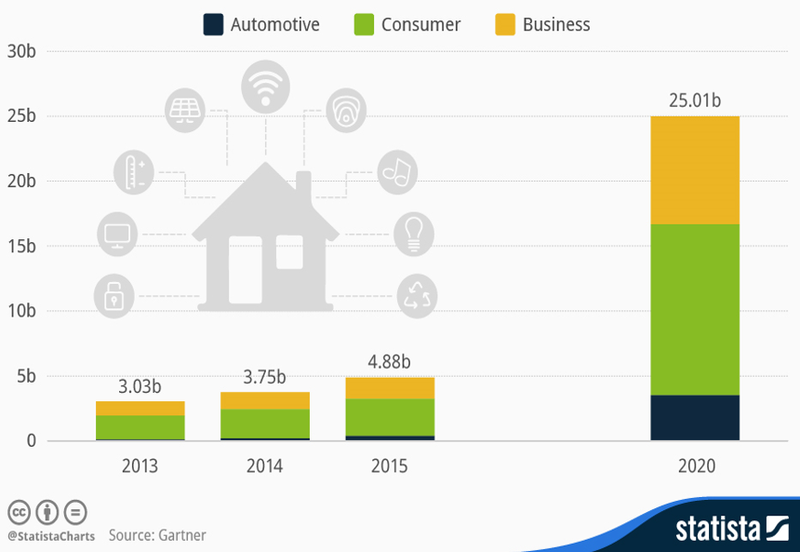 According to Gartner, some 8.4 billion web-connected devices were in use as of 2017. That's more than the reported world population of 7.6 billion. 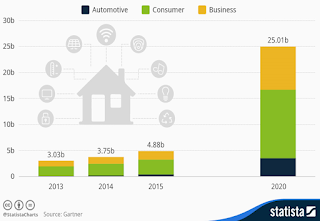 Projections are for 25 billion IoT devices by 2020 and 50 billion by 2025 (Figure 2). If the emergence of artificial intelligence (AI) is to flower, it's the IoT and the data it collects that will fuel the growth. There's lots of ongoing research in the areas of fog and edge computing that will localize computation of the IoT sensory data, either on the devices themselves or on nearby computing hubs, so that the data won't have to be sent to the cloud. That, in turn, will spark a drive to optimize IoT hardware architectures and machine-learning AI chips. In upcoming posts, we'll begin looking at the test and measurement challenges posed by IoT devices.